I am one of Nico Bolzico’s fan and everyday I always check his Instagram account and stories for an update. This past few days, I noticed that he is constantly sharing a picture of him featuring Lay’s and even his friend Potato the turtle. I was intrigued because I don’t know if he is an endorser or not but after knowing that his Idol is a Lays endorser then maybe he wants to be one too. And also after seeing Lay’s Philippines Instagram stories my confusion was fully solved, that he is not yet an endorser, because Lay’s finally respond to Nico’s stories asking if he’s up for the challenge. The challenge is if he can be Intense as Barbeque, Cheesy as Cheddar, and Sassy as Sour Cream then if he can, they can talk about it. As a fan, I am wishing to Lay’s Philippines to grant Nico Bolzico’s wish as one of Lay’s endorser because I know that he portray all the challenges that Lay’s gave to him. He can be Intense as Barbeque by having no fear in every challenges that he will take. He is passionate enough to do a certain tasks that is given to him and I know that he will exert his best in order to achieve it. He is Cheesy as Cheddar and I think I don’t have to prove this anymore. With his Instagram posts about his Wifezilla and his comments on Solenn Huessaff’s posts, it all screams the cheesiness within him. And lastly he can be Sassy as Sour Cream because he is a very stylish man that holds a lot of confidence and energy that no one can oppose. 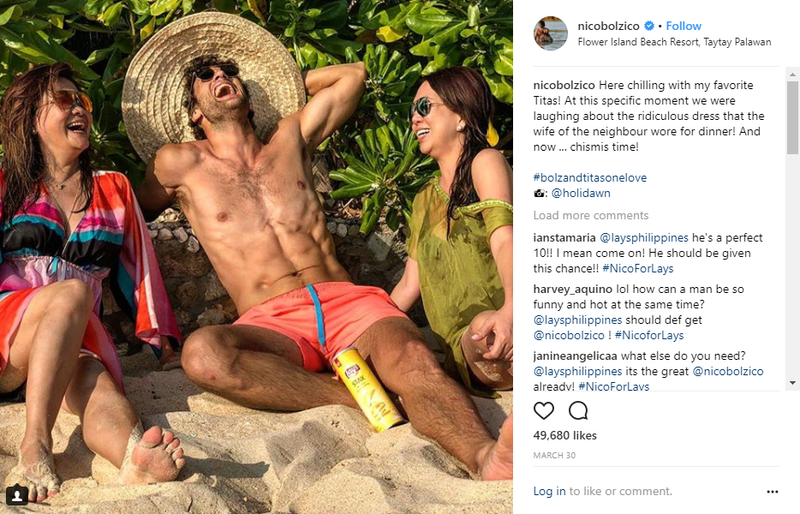 Nico Bolzico is a try and tested endorser and I can say that he endorse very well. The products that he endorse are very successful because of his antics and tactics. He is very famous here in the Philippines and he being an Argentine makes it a plus point because the product will not only be hear here in the Philippines but also in different countries. Most of us know that Nico Bolzico is a funny guy that can easily charm the hearts of the people. Who don’t fall to a guy that is full of humor? He can influence the customers because of his witty remarks that can easily remember everytime they saw the product in the market. And lastly, Nico Bolzico is Nico Bolzico. Whose name starts with N and ends with an ICO. Lay’s is all about great and different flavors that’s why Nico is the best endorser that they will have because he carry a great multi-faceted personality. What a good combination, right? Good luck Nico Bolzico!